Talavera is the name given only to the earthenware ceramics produced in the Puebla region of Mexico. 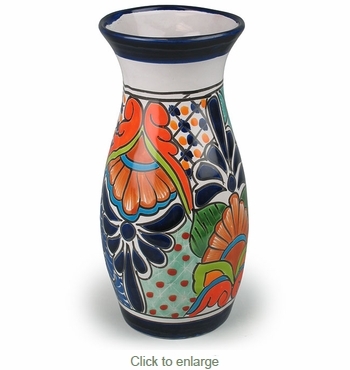 Our Talavera vases will brighten up any room in your home with southwest and Mexican flair. All of our Talavera home accessories are handmade and hand painted by Mexico's talented potters. Direct From Mexico will carefully pack your order to ensure it arrives to you safely. Traditional Assortment: The design shown is of the Traditional Talavera style. Your vase will be chosen from our current assortment of available colors and designs. The item you receive will likely be different than pictured here.